We stock the CleanLineTM by Permaloc. 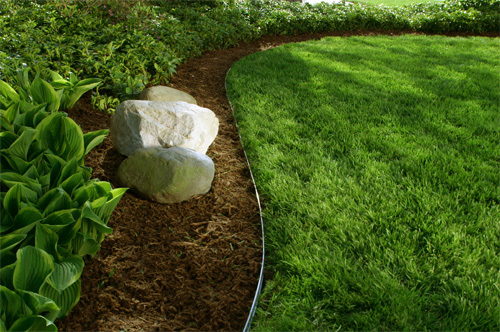 CleanLime is engineered to allow for effortless installation and creates a beautiful, clean edge in any landscape. It comes in 8' sections and comes with 3 heavy-duty 12" interlocking aluminum stakes that securely anchor it into the ground, providing long-term retention and ensuring that your designs will stand the test of time. It is stocked in Mill finish and Black duraflex. Get that crisp look with well defined beds and gardens. An easy weekend project that will make your landscape stand out. The best part is it's going to outlast your neighbor's box store edging.